Crunchy chewy Spanish donuts served with thick, rich hot chocolate for dunking. Churros are made from dough pastry (water, flour, and salt) that has been pumped through a star-shaped churrera, giving them an appealing ridged texture. The dough is then fried until crunchy and variably dusted (or even coated) with granulated sugar. 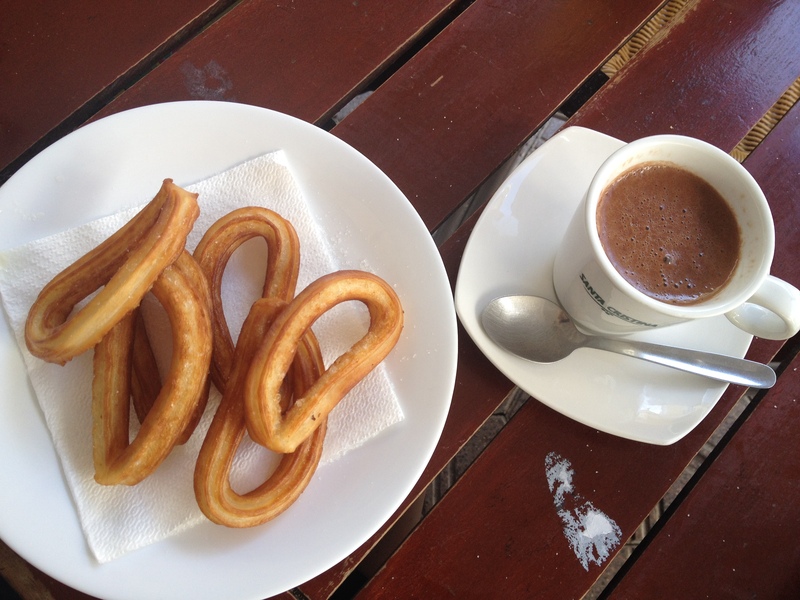 The teardrop-shaped churros at Café Central in the coastal town of Tarifa are the best I have tried. They are lightly chewy on the inside, delightfully crispy on the outside, and served piping hot with chocolate so thick you can almost stand your spoon in it. Perfection. That is sad. Churros with coffee sounds delicious! I love the churro and hot chocolate combo. That’s common in Bogota, too, where I’m living. Delicious! I spent some time in Bogota 14 years ago, but sadly didn’t have any churros while there. It must be nice to have such easy access to such a delicious treat!